Loved the size of the apartment, beautifully appointed decor, kitchen and old world character. The location was fantastic, on a plaza directly opposite Santiago church, and only a stone's throw away from the old city and the fabulous Plaza Mayor. Eva, was very helpful when we arrived and the place had everything we needed, including a very nice bar below which does some great local food. (We texted arrival time to number provided, but later told that their phone did not accept texts) After mix up about our arrival, we were given direct access to speak to owner in English (on her Spanish mobile), when we did meet up with key holder. 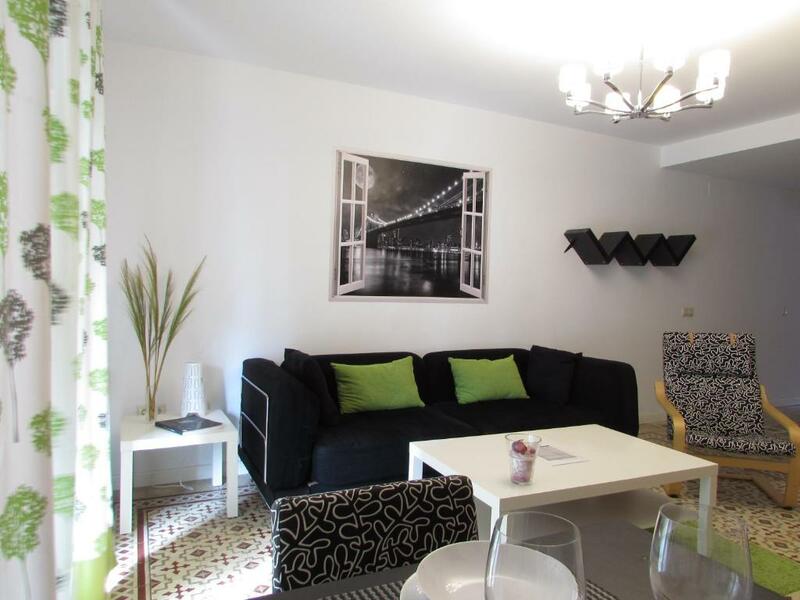 Great apartment right in the center of the town. Everything is in reach with a few minutes of walking. The apartment is nice, cozy and tastefully decorated. Everything is there: fast wifi, well equipped kitchen, washing machine and a strong hairdryer (which was important as I had to cycle a full day in rain). extrem friendly host, absolutely reliable and supportiv! Couldn't be better! Wonderful location! Everything top! Excellent ground floor apartment for small kids. Spacious and in a great location - short walk to Plaza Mayor. Staff very accommodating. 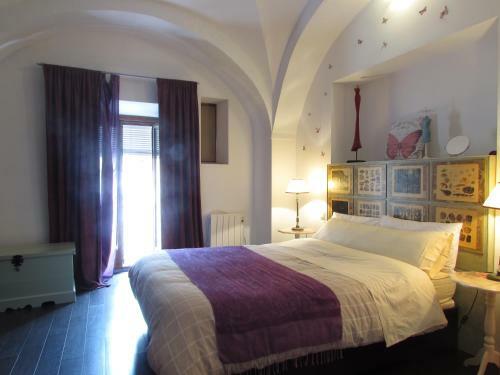 Superb location in the historic part of Caceres. Apartment is spacious and with all quality amenities provided, very clean and local shops are nearby. Great place to see the town and surrounding places. The hostess (Maria Eugenia) is truly excellent and helped with everything. Would definitely return !!! Very comfy, well-equipped and central base for our family of 4. Eva was beyond helpful with check-in. 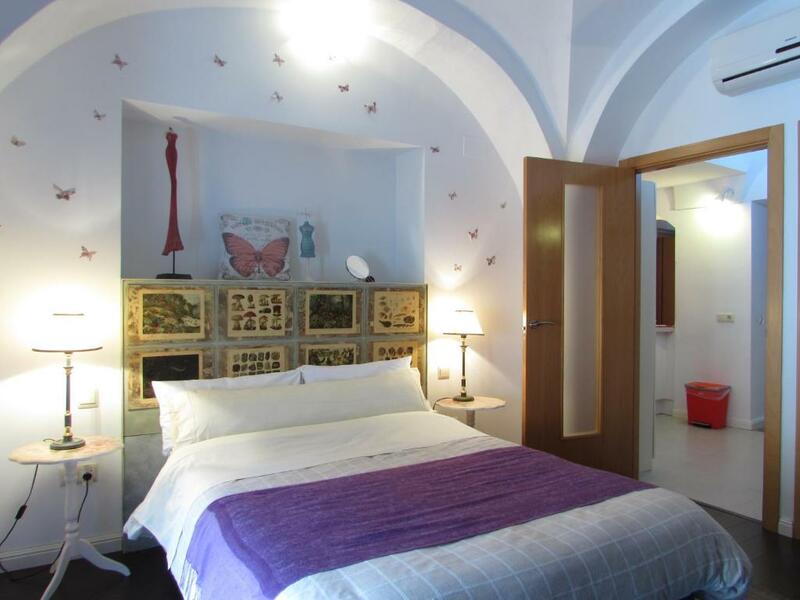 The apartment has an excellent location on a quiet square overlooking the church. Nevertheless, it is only a 2-3 minute walk from both the Plaza Mayor and the Ciudad Monumental. Flat is clean, well-decorated and comfortable. Fold out bed in the lounge was fine. Eva did an excellent job making sure we had everything we needed. La ubicacion del apartamento.El trato de la anfitriona.la limpieza y tranquilidad del apartamento. Lock in a great price for Apartamentos BeHoliday Santiago – rated 9.4 by recent guests! 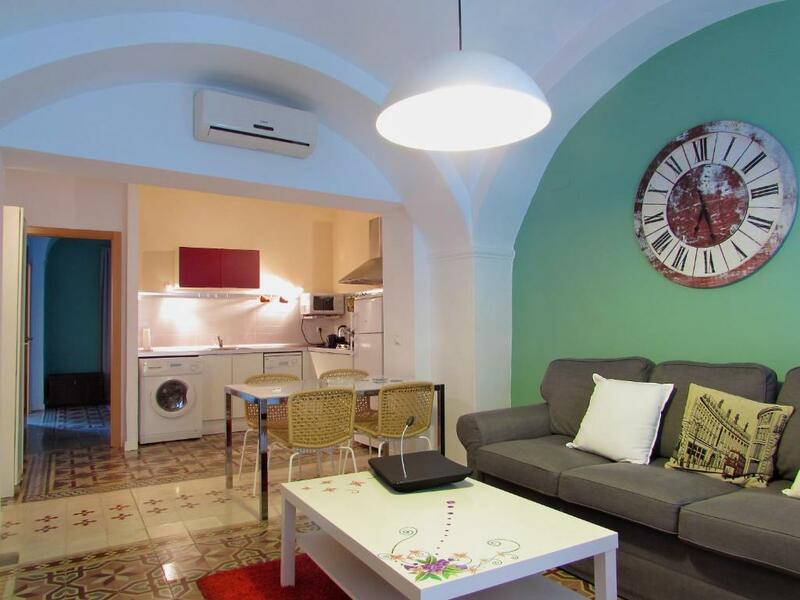 Set in a restored 200-year-old building, in Caceres Old Town, Apartamentos Santiago offers air conditioning and a private balcony with city views. The apartments are located 5 minutes´ walk of monuments, shops and restaurants. Featuring vaulted ceilings, the spacious apartments have a living room with a sofa bed, flat-screen TV and dining table. A washing machine, dishwasher, small hob and microwave are included in the kitchen. There is a double bedroom and a bathroom with a shower, hairdryer and free toiletries. Santa Maria Cathedral is 800 feet from the apartments, while Caceres Museum is 1,650 feet away. When would you like to stay at Apartamentos BeHoliday Santiago? 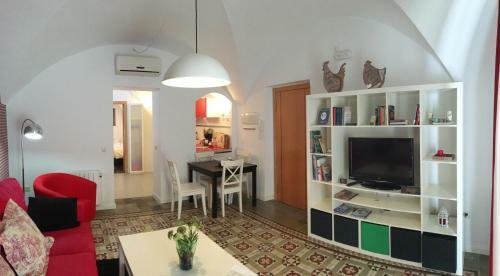 This air-conditioned apartment has a living room with a sofa bed, flat-screen TV and dining table. A washing machine, dishwasher, small hob and microwave are included in the kitchen. There is a double bedroom and a bathroom with a shower, hairdryer and free toiletries. Guests can store their bicycles in the apartment. This air-conditioned apartment has a living room with a sofa bed for 2 children or 1 adult, as well as a flat-screen TV and dining table. A washing machine, dishwasher, small hob and microwave are included in the kitchen. There is a double bedroom and a bathroom with a shower, hairdryer and free toiletries. This apartment features a double bedroom and a bathroom with a shower, hairdryer and free toiletries. The kitchen comes equipped with a washing machine, dishwasher, small hob, and microwave. Please note an extra bed is available on request extra charges might apply. This air-conditioned apartment has a living room with a double sleeping sofa bed, as well as a flat-screen TV and dining table. A washing machine, dishwasher, small hob and microwave are included in the kitchen. There is a double bedroom and a bathroom with a shower, hairdryer and free toiletries. 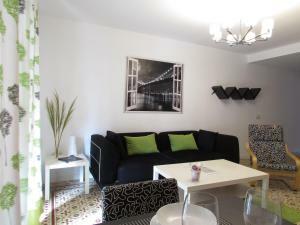 Apartments beholidaySantiago are designed with love and attention to detail. We wish to continue growing in a responsible manner, so we are committed to sustainable tourism and environmental respect. I hold an Travel agency Organiser's Licence issued by the Government Authority CIEX- 1005 Mm. Established in Extremadura since 2005, we have been in travel industry for more than 20 years focus on customer services. House Rules Apartamentos BeHoliday Santiago takes special requests – add in the next step! Apartamentos BeHoliday Santiago accepts these cards and reserves the right to temporarily hold an amount prior to arrival. 1/ There was a very bad smell on entering the apartment. [ We later got rid of it ourselves by cleaning out shower drain into toilet]. 2/ Host did not text us with information even when we had not replied to thier Emails. [They had sent usefull information Emails while we were travelling in Spain, but we did not have access to them until we returned home!]. 3/Please remember:- Not everyone who uses a home computer to book has a suitable phone, [but they could use a hotel's internet if a text asked them to look up an Email question that needed an answer]. 4/ Warn us if your provided telephone number does not get texts! Washing up sponge SHOULD be changed regularly! We had to buy one!! Local parking around the apartment is difficult, but you can get near enougn to unload bags etc. Secure public parking is about 5 minutes walk away at one of the Hotels, not hard to find and rates are good. Mattress - but everything else was ideal. You'll be lucky to get a parking space on the square. Much better to park on Calle Betania and walk up the hill for a couple of minutes. This also makes it a lot easy getting in and out of the city.